How many faces of Henry VIII’s first queen? update: flickr has fluckered – after two years it now refuses the embed. No problem – please click the original flickr page (new window) for what was always a better version of the slideshow. The later three images, from her time as queen, are crude compared to the earlier four. The portraits from 1501 and 1505 are by Michael Sittow, and that from 1496 by Juan de Flandes: both artists collaborated at the Spanish court of Catherine’s mother in the late 15th century. On the left, the fascinating Joanna of Castile (Joanna the Mad), the most privileged woman of the age. In the middle … her little sister. On the right, the Sittow woman again. Aren’t the Flandes portraits both of the same subject? The portrait on the left is definitely of the big sister, and there are obvious differences. But the gallery housing the middle portrait does express doubt on identification. I think comparison with the Sittow portraits (the noses!) shows the subject in the middle cannot be Catherine. Superb, but a miss. Another complication is that Catherine may not be the subject of any of the Sittow portraits. Jeez. Their subjects are probably the same, but there is no certainty about the famous Vienna portrait on the right (with the halo): it was painted in 1503-05, when Sittow may have been in England, but not much more can be said about identification. Maybe the monkey portrait in the slideshow confirms the shape of the Sittow nose. Or perhaps the subject of the 1496 portrait really is Catherine, a girl with slightly less noble features than her sister. In sum: doubtful of the four superb earlier images, and reasonably certain of the crude portrayals of Catherine in her later years. The contrast between early and late is sharp – a pitiful fall during her life in England. 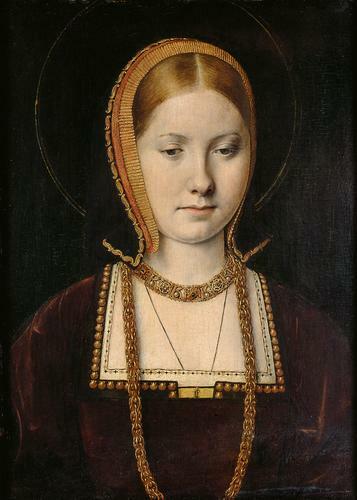 My view is that all but the 1496 portrait are of the same subject, and that the latest portrait – the round miniature – is of Catherine. Therefore that makes 6 out of 7. Still a mystery. Sorry about that! And in honor of the occasion of Henry VIII’s cooanrtion, Westminster Abbey closed down not in remembrance of Henry, but for some private services for new bishops, services that could have been held at any time. For Henry they did nothing at all, except deny admission to those who wanted to go to the Abbey to mark the occasion.